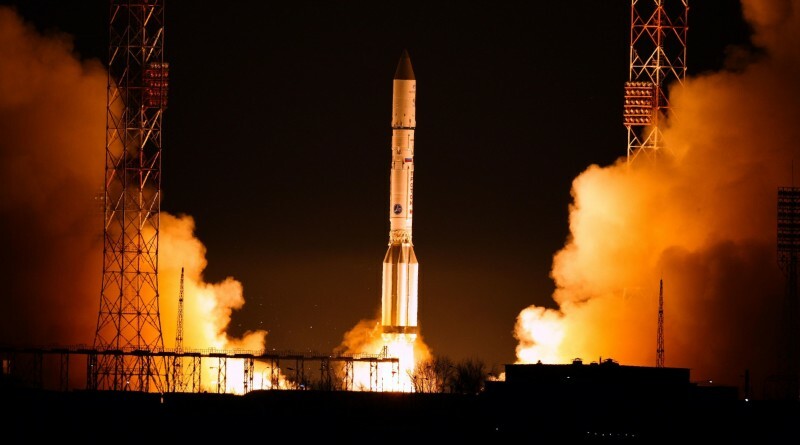 A Russian Proton rocket raced into the night skies over the Baikonur Cosmodrome on Friday, embarking on a long overnight mission to deliver the Eutelsat 9B communications satellite to Geostationary Transfer Orbit. 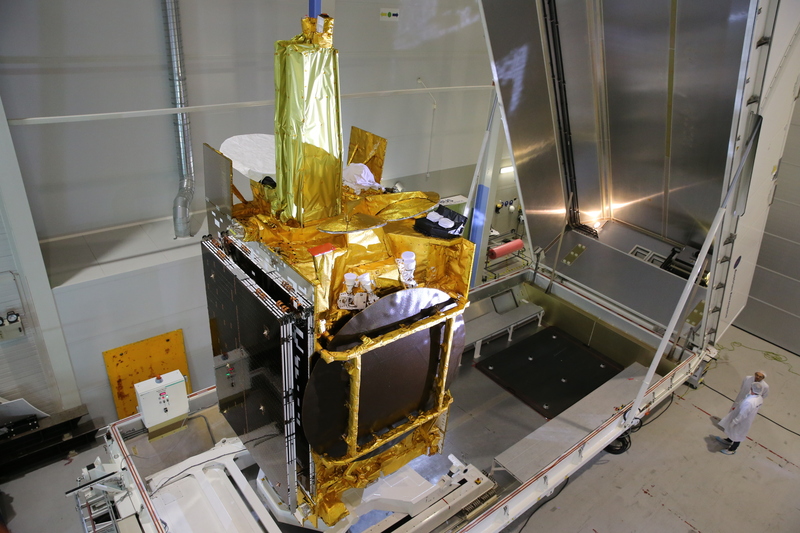 Eutelsat 9B is equipped with an all-Ku payload for TV distribution across Europe and also hosts the first European Data Relay System terminal to build a high-speed data highway between Earth and space through the use of advanced laser communications. 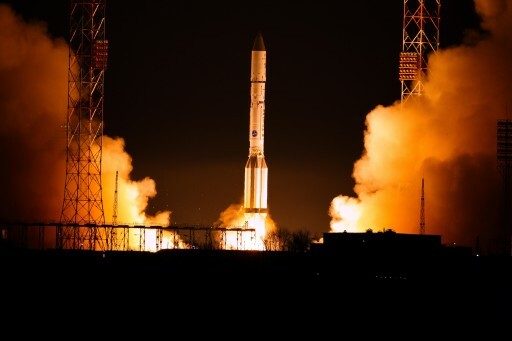 Proton-M lifted off from Site 200/39 of the Baikonur Cosmodrome at 22:20 UTC, lighting up the night skies over the Kazakh launch site with its six engines rumbling away to lift the 712-metric-ton rocket. 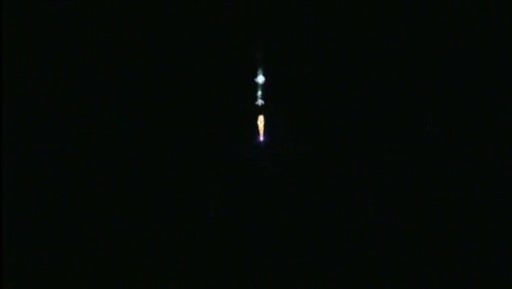 Sticking to its standard ascent profile, the three-stage Proton showed a rock solid performance, releasing the Briz-M upper stage just under ten minutes after launch to begin its long climb to GTO. Starting out in a sub-orbital trajectory, Briz-M was tasked with an initial burn to enter a circular Parking Orbit, followed by three burns to raise the apogee and a fifth burn to lift the perigee of the orbit and reduce its inclination. Spacecraft separation into the target orbit was confirmed nine hours and 12 minutes after liftoff – 7:32 UTC on Saturday. 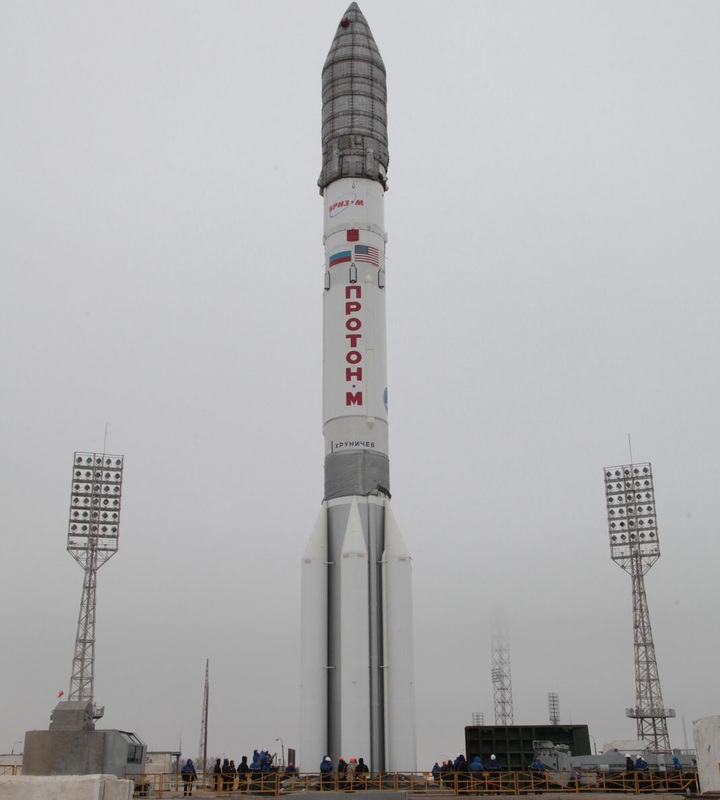 Friday’s launch of the Proton-M marked a final dress rehearsal for the venerable launcher as it gears up for its next flight that will reach for Mars, lifting the ExoMars 2016 mission. In recent years, Proton and its Briz-M upper stage struggled with keeping up a reliability record, on average failing once every nine missions. Proton’s reliability issues led to discussions regarding ESA’s choice of partnering up with Roscosmos and launching the 2016 ExoMars flight and a subsequent mission on the Proton booster. In 2016, Proton currently looks at a manifest of up to eight missions, four government missions and four flights contracted through Proton’s commercial operator International Launch Services. With over 400 flights in a career spanning over five decades, Proton is hoped to redeem itself as a reliable vehicle with a streak of successful missions and again gain some lift in the commercial launch market after trouble securing launch contracts given its recent failures. Proton picked up two multi-launch agreements last year with satellite operators Intelsat and Eutelsat as both companies expressed interest in keeping up a diversity in the launcher industry with at least three providers on the market. The contract for Eutelsat 9B was awarded prior to the multi-launch deal and the satellite initially expected to launch in the first half of 2015 but had to stay on the ground due to last year’s Proton failure and subsequent manifest management. 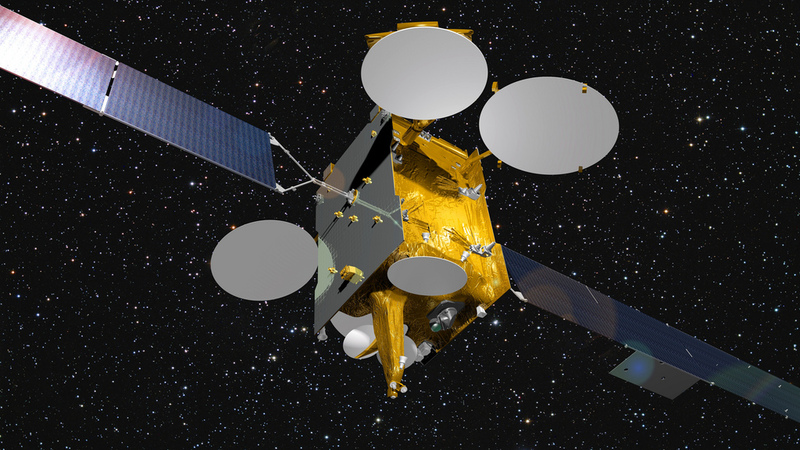 The 5,162-Kilogram Eutelsat 9B spacecraft, built by Airbus Defence and Space, hosts a primary KU-Band payload comprised of 66 transponders to deliver hundreds of TV channels to customers across Europe. Eutelsat 9B is also fitted with the EDRS-A payload operated by the European Space Agency as the first of at least two laser communications terminals deployed to Geostationary Orbit for the European Data Relay System. Widely regarded as the future of communications, optical communications technology has a number of advantages including extremely high data rates, low transmit power, compact payloads, and high signal travel distances. 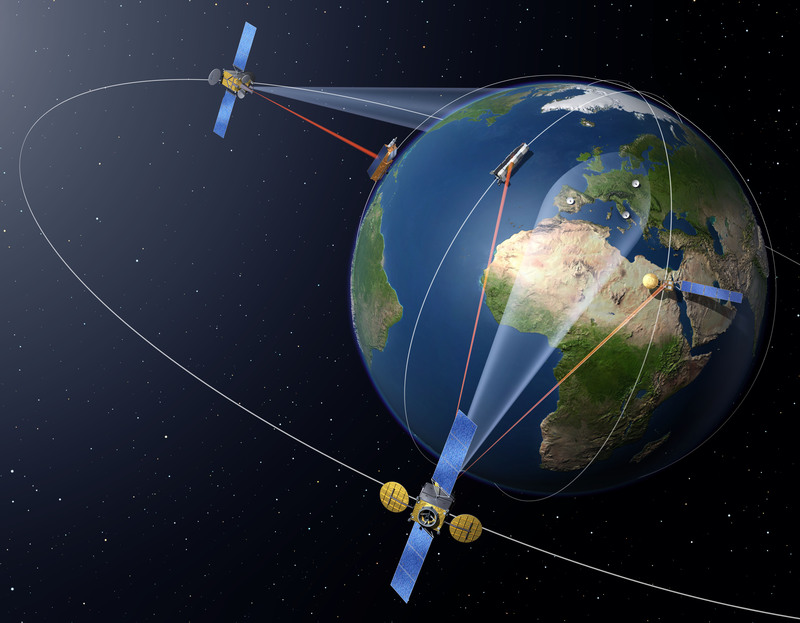 EDRS aims to establish a high-speed data highway to space, employing laser terminals on low-orbiting spacecraft capable of transmitting optical signals to corresponding Laser Communications Terminals in Geostationary Orbit. The GEO terminals accept the 1.8Gbit/s optical signal and convert the modulated laser signal back to conventional radio signals downlinked to one of four ground stations in Europe using a Ka-Band system. The advantage of communications terminals in Geostationary Orbit is the ability to cover a large portion of a satellite’s orbit compared to the short communication sessions possible when only relying on ground stations. The major goal of EDRS is to deliver satellite data to users as fast as possible since data latency can be an issue for many operational applications of satellite data for example in the maritime sector where monitoring of ice flows is significantly enhanced through real time data as opposed to imagery taken days earlier. EDRS-A installed on the Eutelsat 9B satellite will cover Europe, Africa, the Middle East, the Atlantic Region and portions of the Americas. The EDRS-C satellite, set for launch in 2017, will host the EDRS terminal as its primary payload and enter a spot east of EDRS-A to cover Asia and the Indian Ocean. A third EDRS node is planned to launch before 2020 if funding can be secured in order to expand the system to global coverage. 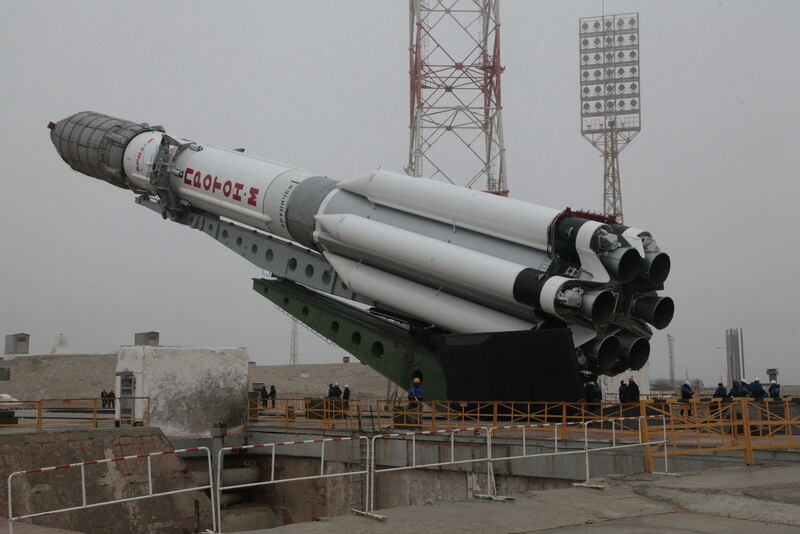 Proton-M enjoyed a smooth launch countdown that began eleven and a half hours ahead of the planned T-0 time with the activation of the Briz-M upper stage for checkouts and flight software load. Proton was powered up around seven hours ahead of liftoff and the hazardous propellant loading operation picked up at T-6 hours to load the three stages of the rocket with 622 metric tons of Unsymmetrical Dimethylhydrazine fuel and Nitrogen Tetroxide Oxidizer. With fueling complete, teams closed the rocket out for liftoff and Proton was revealed 70 minutes prior to launch as the Service Structure was rolled back to its launch position, revealing the 712-metric-ton launch vehicle illuminated by floodlights. Proton went through a final set of reconfigurations while the Eutelsat 9B spacecraft made its transition to launch mode by transferring to internal power to get ready for its ride to space. Proton entered its automated countdown sequence at T-5 minutes when the Flight Control System was aligned and the Master Sequencer calculated the precise T-0 time based on the 5-minute hold release. Briz-M made its switch to internal power at T-5 minutes. 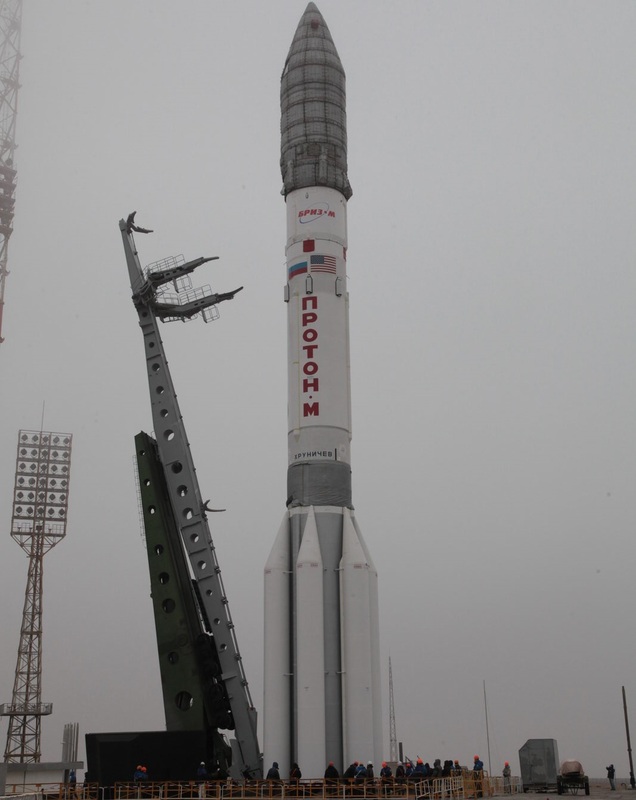 Proton-M began pressurizing its tanks for flight and all reached a stable pressure. 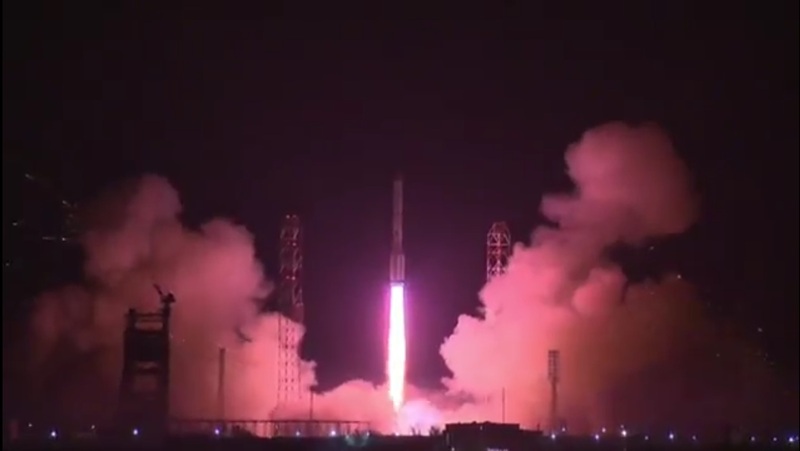 Proton-M made its transfer to internal power at T-2 minutes and the upper stage initiated its Master Sequencer that provided a GO signal to the launch vehicle with the LV Ready signal arriving at T-1:53. A final health poll at T-3.1 seconds cleared the way for engine ignition. Proton-M started breathing fire at T-2.5 seconds – igniting its six RD-275M engines that throttled up to an initial thrust stage before ramping up to a full liftoff thrust of 9,942 Kilonewtons – 1,014 metric ton force. Roaring into the dark skies over the Baikonur Cosmodrome, Proton made an on-time liftoff at 22:20:09 UTC, climbing uphill for the first seconds of its flight, balancing by gimbaling its first stage engines. With an initial thrust to weight ratio of 1.42, Proton quickly initiated its roll and pitch maneuver to get aligned with its north-easterly launch trajectory using the standard 61.3° azimuth that has become the usual route to Geostationary trajectories from Baikonur. Burning its engines at full thrust, Proton consumed 3,600 Kilograms of propellants each second of powered flight, passing Mach 1 and heading through the area of Maximum Dynamic Pressure right around the T+1-minute mark. The first stage of the Proton, featuring the characteristic external propellant tanks, has an overall length of 21.2 meters and a diameter of 7.4 meters, holding a propellant load of 419,000 Kilograms to be consumed by the powerful main engines during the first two minutes of the flight. The first stage performed as planned and reached the end of its propellant supply one minute and 59 seconds into the flight with staging taking place in hot mode – shutting down the first stage followed immediately by the ignition of the second stage with the firing of separation charges a few moments later so that the stages could be pushed apart by the second stage’s exhaust – sending the first stage towards a crash landing 310 Kilometers from the launch site. With its three RD-0210 engines and single RD-0211 up and running, the second stage delivered a total thrust of 244,600 Kilogram-force. The stage measures 14.5 meters in length and has a smaller diameter of 4.14 meters, holding 176,800 Kilograms of propellant at liftoff. 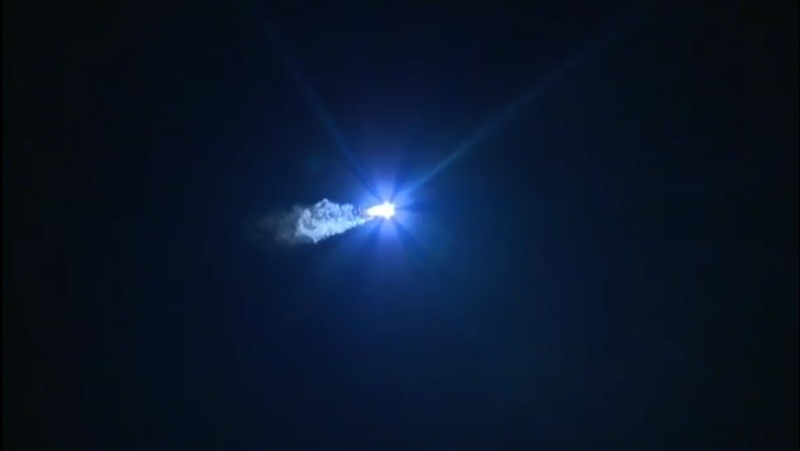 Real time calls from the launch bunker remained positive throughout the 3-minute and 28-second burn of the second stage, indicating that Proton was on a good trajectory and all systems were functioning to satisfaction. Separation of the second stage was also accomplished through a hot staging sequence – starting with the ignition of the four-chamber RD-0214 vernier engine of the third stage that reached a thrust of three metric ton force. 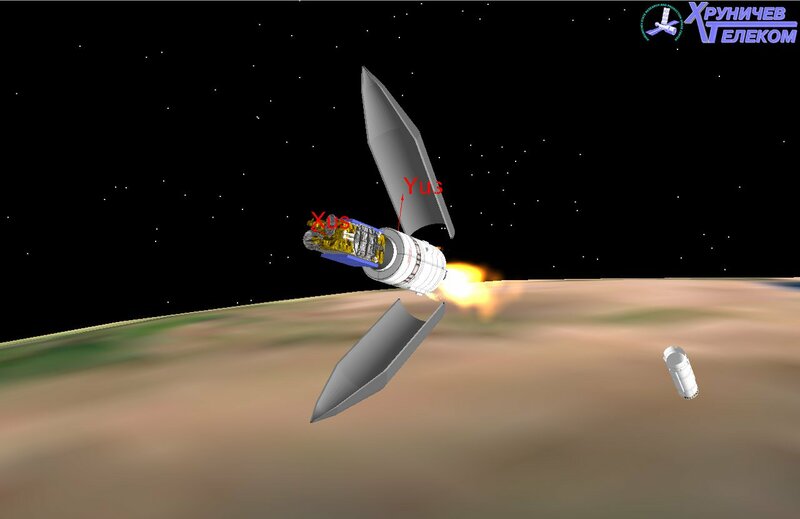 At T+5:27, the second stage was shut down and the separation pyros fired so that the third stage could pull away under the power of the vernier before igniting the RD-0213 main engine once clear of the second stage that was looking forward to re-entry and an impact 1,990 Kilometers downrange. Taking control of the flight, the third stage of the Proton delivered 59,450 Kilogram-force of thrust. It is 4.14 meters in diameter and 6.5 meters long, launching with 46,660 Kilograms of propellants to be used up as part of a four-minute main engine burn. Separation of the fairing was confirmed just shy of T+6 minutes. Proton got rid of no-longer-needed weight as the launcher had left the dense atmosphere at that point and the satellite was no longer endangered by aerodynamic forces. Main engine shutdown on the third stage occurred nine minutes and 31 seconds after liftoff while the vernier fired for another 10 seconds to finish Proton’s job of inserting the orbital unit into a sub-orbital trajectory. Nine minutes and 42 seconds after liftoff, the Briz-M stage was separated and assumed control of the mission – tasked with a five-burn to GTO flight profile. 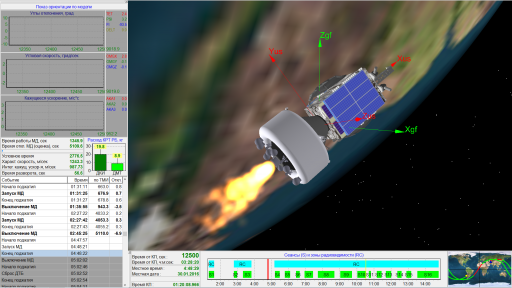 After separation, the Briz-M initiated a stabilization using its attitude control thrusters for a 94-second coast phase to climb uphill in order for the first burn to circularize the orbit. Briz-M ignited its propellant settling thrusters, preceding main engine ignition by ten seconds to create safe conditions for ignition through the small acceleration imparted by the thrusters that creates a two-phase system in the propellant tanks ensuring the main engine on receives liquids. The S5.98 main engine of Briz-M started at T+11 minutes and 16 seconds to put the stack into a Low Earth Parking Orbit. Briz-M automatically adjusted its flight profile to correct for insertion inaccuracies of Proton-M, shortening the burn slightly to reach the planned 173 x 173-Kilometer Parking Orbit at an inclination of 51.6°. Overall, Briz-M weighs 22,170 Kilograms and its 4.1 meters in diameter and 2.6 meters tall sporting a single main engine, four propellant settling thrusters and a series of attitude control jets. The S5.98 main engine delivers 1,940 Kilogram-force of thrust and can perform multiple burns, allowing Briz-M to access a variety of orbits. After orbital insertion, Briz-M coasted for 52 minutes to set up the proper position for the second burn that targeted the equator passage on the ascending node to place the apogee of the orbit right above the equator. Firing its engine for 17 minutes and 40 seconds, Briz-M is reached an orbit of 277 by 5,007 Kilometers at an inclination of 50.3 degrees. The burn started when Briz-M was over the Atlantic Ocean and continued as the stage passed over Africa, ending before the vehicle headed over the Mediterranean. Therefore, Briz-M performed two apogee-raising maneuvers, separated by a coast of nearly an entire orbit. The third burn began at T+3 hours 28 minutes and 21 seconds and lasted 13 minutes and 33 seconds. 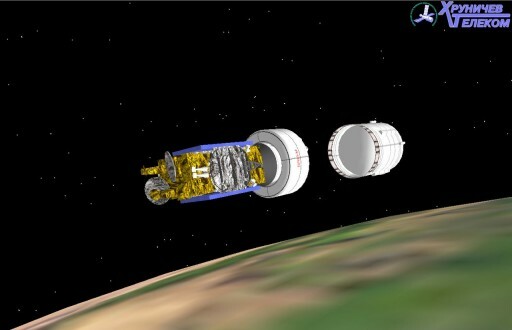 53 seconds after engine cutoff, the Auxiliary Propellant Tank was separated from Briz-M while the settling thrusters were firing to create separation distance between the upper stage and the spent tank. The APT contains 14,600kg of hypergolics while the core Briz-M tanks hold 5,200kg of propellants. It was tracked in an orbit of 333 by 16,739 Kilometers inclined 49.5°. The fourth burn was performed shortly after APT jettison to finish raising the apogee by firing the engine for 3 minutes and 48 seconds, achieving an orbit of 443 by 35,687 Kilometers inclined 49.0 degrees. The 2/3 burn pair stretched from a position over the Pacific to just of the north-western coast of Africa with APT jettison taking place over the Atlantic. 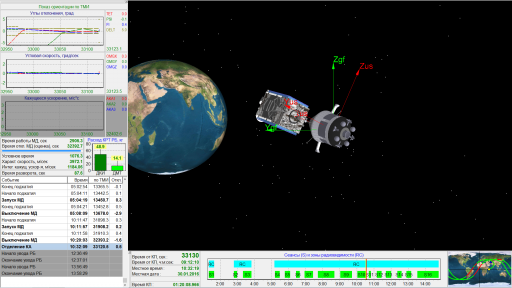 Spacecraft separation occurred after a re-orientation maneuver at T+9 hours and 12 minutes, 7:32 UTC on Saturday, marking the completion of the long Briz-M flight. After separation, the satellite was to establish attitude control and communications with the ground for its initial set of operations including a series of apogee maneuvers occurring in the coming days as well as the deployment of the solar arrays and communication antennas. 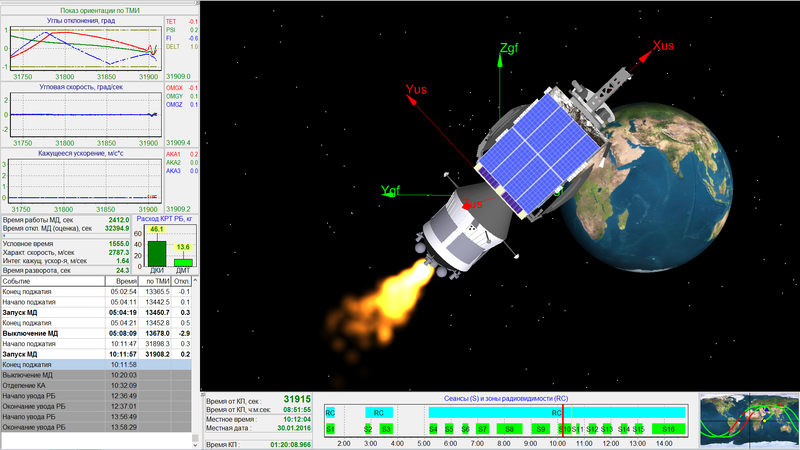 Briz-M is tasked with two disposal burns, the first a 12-second maneuver at T+12:36:49 and the second a 100-second burn at T+13:56:49 – lowering the apogee and perigee of the orbit to move it out of the way.